Amir Mansoor, established Maldivian business man, and Agnes van Linden, starting entrepreneur, met in 2008 in Male. Amir had just finished building a new safari boat, the then called Tropic Breeze and was about to sell her off to a surf operator when the two met. As a result he changed his plans and opted to run the boat together with Agnes. They changed the name into Carpe Diem and started the company Carpe Diem Maldives Pvt. Ltd. with the operation of the Carpe Diem. Business picked up very quickly and after signing a deal with Explorer Ventures they decided to build a second boat together, the Carpe Vita which became an upgraded sistership of the Carpe Diem and has been in operation since 2011. Ten years down the line, they have managed to build up a successful brand, which was awarded “Leading liveaboard brand of the year in 2015 and 2016 after launching their 3rd boat, the Carpe Novo in March 2016. Currently they are building a resort in Raa atoll, Carpe Diem Beach Resort & Spa expected to open summer 2018 and they will probably have more up their sleeves, so stay tuned…. ;-). An Accountant and Professional tennis player turned businessman. Born in a family of 11 siblings, Amir showed a talent for business already at a young age. When he was attending the 8th grade he started working as a clerk for one of the biggest resort chains at that time. He continued working for the company for 14 years and worked his way up to accountant. During this period he also pursued his passion for fishing and started running fishing boats and supplying the resorts with the fish caught by his boats. He ultimately had a fleet of 6 fishing boats he bought and an additional 3 he built. These 3 becoming the first boats he built and not the last. After leaving the company he run a fishing factory in Meemu for a short while followed by starting his own import business called Uni foods supplying resorts with vegetables and fish and continued to add staple foods and other items. He became representative of the Evian brand and was becoming a force to reckon with in the industry. Three years later Lily Enterprises invited him to join as a shareholder, where he has worked ever since (15 years and counting). During this period Amir has seized and continues to seize opportunities in a lot of other businesses like starting his own alcohol import company Grape Expectations, starting the Liveaboard company Carpe Diem Maldives and others as mentioned in the summary below. In his free time Amir loves to play tennis. He started playing tennis when he was 14/15 years old. Soon after he was asked to join the national team at 17 years old as he showed real talent. At 20 years old he won his first National Champion title and has won it in total 8 times, the last one when he was 36 years old. He continues to win many tournaments however and stays well in shape. He seems to have gotten his talent from his mother who was a very sporty lady and has won National Champion Tennis and Table Tennis titles. …. Waterline Maldives Pvt Ltd.
Lily International (popularly known as Lily F&B Suppliers) handles the largest number of world renowned brands acting as the sole agent and distributor in the Maldives. The group enjoys having the sole agent and distributor in the Republic of Maldives for many significant portfolio of world renowned international brands, such as as Evian, San Pellegrino, Acqua Panna, Perrier, Badoit, Nestlé, Fonterra, Carlsberg Beer, British American Tobacco, Johnson Diversey, Firefly, Ceres, Kean, Dewlands, Riscossa, Erdinger Beer, Bakemark Interrnational, a large range of South African and Italian wines, Concha Y Toro, Trivento, more than 50 labels in Cuban Cigars and various other F&B brands. A company registered on 2011, to carry-out the management and operations of Bonded Ware house and related products in Republic of Maldives. Shipyard Located in Raa Atoll Innamaadhoo, the shipyard is involved in design and build of various types and size of vessels, an A to Z process starting from keel, frames, ship’s ribs, finishing and outfitting and launching. It was in this shipyard that both M/V Carpe Diem and Carpe Vita were constructed and currently the Carpe Novo is being constructed.. In-addition, of boat building, slipway services are provided for local fishermen, safari operators etc. The company was started in 2008, is now one of the finest cruise operators in Maldives and operates a fleet of two (02) and soon to be 3 Safari Liveaboards in the Maldives. The Safari operations were found on the concept of offering competitive and high quality first class services. M/V Carpe Diem is the first boat, started operating in 2008. The vessel was built in the Maldives fully out of wood by Mr. Mansoor who has been the main architect of the design and development. The boat has 10 cabins (20-pax) over 3 decks and offers scuba diving, surfing trips, fishing and many more. M/V Carpe Vita is the second boat started operating in 2011. The Cruiser is a 38-meter luxury yacht. The boat has a total of 10 cabins (20-pax) divided over 3 decks and offers scuba diving, surfing trips, fishing and many more. Opening of Marrybrown in the Maldives on 23rd September 2011, I became the first international fast food chain operator in Maldives and Master Franchisee of Marrybrown. The Company is also engaged in exports of various goods and services to Maldives and is planned to expand the business activities. As part of the business expansion program under AM Exports Sdn Bhd, Marrybrown – Malaysia was opened in Jalan Pasar Bahuru, on January 2014. From Immigration Control to Salsa dancing to Scuba diving in the Maldives. I first came to the Maldives in the year 2000 in my official capacity as Immigration Liaison Officer working for the Dutch Immigration Naturalization while based with the Dutch Embassy in Colombo, Sri Lanka. We trained customs, immigration and police in passport and visa fraud detection and thus trying to reduce the number of people boarding to our countries with forged documents. In the year 2003 I was transferred to Bangkok, Thailand, as we closed Sri Lanka and maintained regional responsibilities for Singapore, Sri Lanka and Maldives amongst others. In 2005, while in Bangkok, Tsunami struck and I was one of the only 3 management level staff immediately available when it happened and was called in to assist at the airport with evacuations. After that I was sent to the worst hit area Khao Lak to set up an EU desk in front of the temple of Yan Yao where approximately 3000 bodies were being kept for identification. My mobile phone was the EU help desk! The Netherlands was representing the EU at that time. My job was to try and bring some order in the initial chaos and assist families to find their loved ones or investigate last sightings. In a bizarre way however I ended up doing documents again. There were a lot of documents being found on the shore or washed up in safety deposit boxes from hotels. For the Thai people a Swedish passport was the same as a UK or Netherlands etc. all “Farang” meaning foreign, whereas for the embassies it was very important to be notified when documents were being found as it would not necessarily tell the faith of a person but would be proof of the fact that the person had been in the area when the Tsunami struck. Many families calling in, often did not know where in Thailand their relatives were staying but it would of course make a difference if they were in the North where there was no problem at all or in the tsunami struck areas like Phuket and Khao Lak. Other than that some documents were found on bodies itself which would help identification. I collected the data from all documents found and informed the embassies. Till that date, I had always been a very ambitious lady, always work work work who preferred to go to the airport in the weekends and surprise possible smugglers instead of going out with friends and forget about work for a while. The devastation however of what mother nature caused in a split second, the sadness of families torn apart by loss of their children or loved ones made me realize how short life really is and that it can be over tomorrow. So I asked myself the question “if I were to be taken from this earth tomorrow would I have lived the life I wanted?”. The answer was clearly NO! After more than a week working in Khao Lak, I physically collapsed as I was up almost 24/7 trying to help people and was called back to Bangkok. A rough time followed during which I found it very hard to get back to my normal routine and concentrate on stopping people with forged documents from traveling. I received some professional help, as you need to talk about such experiences and this professional encouraged me start doing things I had always wanted to do, like salsa dancing. We are our worst enemies when it comes to not doing something, we will find all kinds of excuses not to do something instead of just going for it come what may. So I started salsa dancing in Bangkok and lost myself a bit in it. On the dance floor, there were no phones ringing and it was just great fun. Another sport I had started while in Sri Lanka already but just on and of, was scuba diving. While under water no phones either and just peace and quiet. 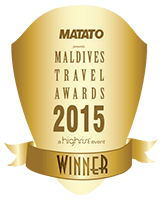 As a result I increased my visits to the Maldives because of the wonderful diving there. Mobile phone calls for me till date are related to something negative as a result of my phone ringing non stop when being the EU help desk hotline during Tsunami period. In 2005 I was transferred to Kenia during which I continued to work with a professional and continued my salsa dancing and scuba diving. I was searching for what it was I wanted in life and just one night it struck me Salsa, Scuba and Spa in the Maldives. With my hotel management background, I wanted to run a resort in the Maldives and increase the entertainment part with dancing and shows and thus combine my favorite hobbies and set up something unique. I started doing my homework and traveled several times to the Maldives to orientate myself on this front, however the amount of money needed was beyond my reach. Plan B however then was to open up a salsa school in the capital of Male and hopefully network my way around and find somebody that would give me that chance. Not knowing that this would happen within 2 days of my arrival in the form of my current business partner. But let me not get ahead of myself. I decided that life starts as 40, gave up my job and moved to the Maldives on June 1, 2008 after having done extensive training in Singapore with a dance school and obtaining my Diploma to teach Salsa basic. So I told my business partner, Amir Mansoor, the story and he looked at me and said well would you like to do it on a liveaboard? He told me he had just finished building a boat, was about to sell it off, but if I would be interested we could talk about it. The next day he showed me the boat, just barely finished. She looked beautiful but I did not know anything about boats nor running a diving operation for that matter. Somehow however he had faith in me and a week later we were in business. 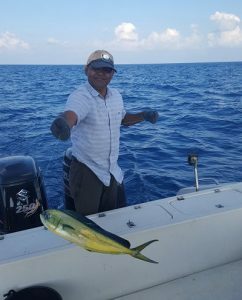 The first thing I did was call the boat Carpe Diem, as you will now know why and we started the company Carpe Diem Maldives Pvt. Ltd. I got really busy, as on August 6th I did the first familiarization trip on the Carpe Diem with friends and family. On the 7th of August we celebrated my birthday in a nearby resort with a dance show from my dance school in Singapore and on 8th of August I opened up my salsa school Majaa Maldives. With the boat we soon got a break and a 3 month contract, during which I and our crew learned a lot and things started running very fast from there. Before we knew it we needed a second boat and that became the Carpe Vita (Seize Life) which my business partner and I built together. The salsa school I run for a while, but unfortunately the Maldivian people were not really ready for it yet, so I closed the school after giving a big show in the National Theatre. I see the school as having been a stepping point towards what I am doing now. Our logo in the beginning had a salsa couple and scuba diver, as in the first two years I did do some salsa workshops on the boat during the trips, however I had to take this off as scuba divers often thought we were not a serious dive boat ;-). 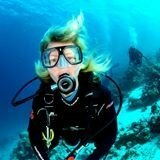 Now we cater for dive as well as surf/kite surf and paddle board charters hence a surfer and scuba diver in the logo. We are celebrating our 10th anniversary this year 2018. After having launched a 3rd boat, the Carpe Novo in 2016, we have been able to build up a brand with a lot of loyal and happy customers and were awarded best liveaboard brand of the year in 2015 and 2016. Currently we are expanding into new territory with the building of a resort in Raa atoll, Carpe Diem Beach Resort & Spa, set to open in summer 2018. The moral of it all is that I am confident that anybody can do anything they set their minds to. Somehow if you believe the “universe” will help you. Life is too short, CARPE DIEM!